When the weather outside is frightful, these delightful and sustainable woolly gifts will warm hands and hearts alike, even if you can’t knit a stitch. From sculptural, pompom-bedecked helmets to glittery, foot-warming slippers, we’ve got your gift list covered from head to toe—and not one Snuggie in sight. 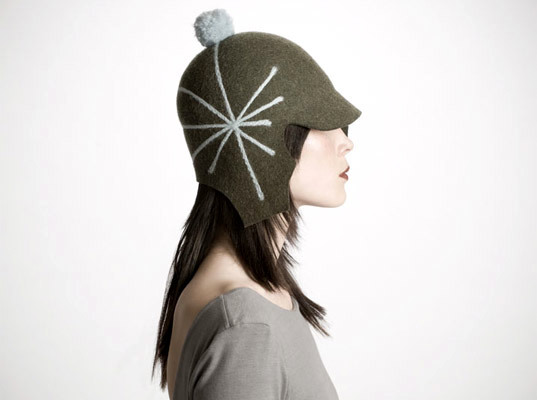 Inspired by by silhouettes from the Roaring ’20s, Claudia Schulz’s handcrafted wool-felt toppers are part eye candy, part noggin warmers. June, in particular, has a festive bent, with a light blue star emblazoned across its side and a kicky pompom perched on top. 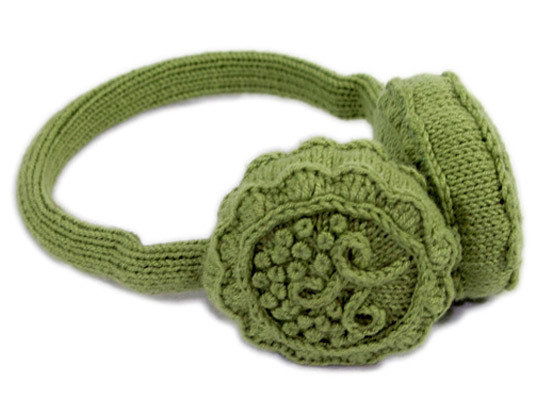 Hand-knitted from hand-combed yak fibers sourced directly (and fairly) from Tibetan herders, Shokay’s Mooncake Earmuffs derive their name and design from a traditional sweet-and-savory Chinese pastry. Myriad color options are at your command, with evocative names like Alpine, Nocturne, and Himalayan Sunset. Sweeter than spun sugar, Giant Dwarf’s Petit Glovettes are handmade to order from recycled cashmere. 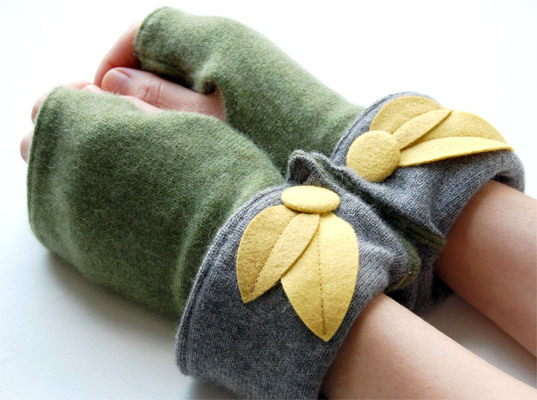 Customize the color of your mitts, from the upper glove and chunky French cuff to the hand-cut felt petals and hand-pressed buttons. 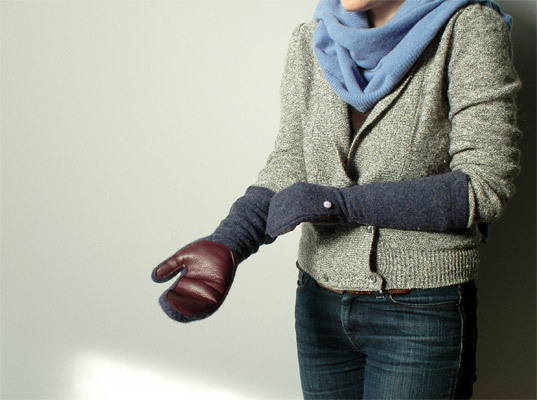 Keep frostbitten fingers at bay with these elbow-length mittens, which are made with recycled, felted lambswool and stitched with recycled leather palms. Simple without being staid, the mittens are topped with pale purple grosgrain buttons that have been hand-covered in vintage fabric. 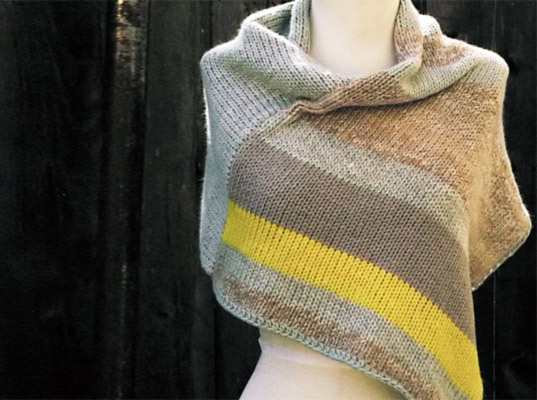 Oishii’s Cosi Knit Capelet, like all of designer Erika Kemp’s cold-weather garb, is hand-knit in the United States using a luscious mix of merino wool, alpaca, and kid mohair. Whether draped like a wrap, slung across a shoulder, or worn as a mini-poncho, the versatile number makes layering for warmth a cinch. Help your favorite urban cyclist stay chic and safe at night with Lost Value’s high-visibility, reflective knit accessories, which look like regular gear by day but become self-illuminated at night. Available in three designs and seven colors, the LFLECT reflective scarf is hand-stitched in Scotland using local Highland wool. Toes will be kept nice and toasty (“toes-ty”?) 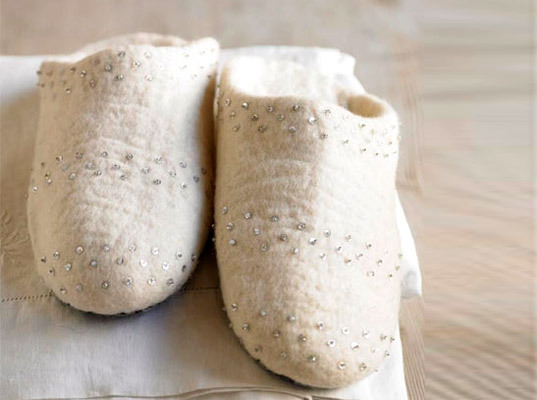 in these opulently soft slippers, which are felted from New Zealand wool and dyed with vegetable-based dyes. Bonus: The extra bling factor in the form of tiny, cheer-inducing sparkles. When the weather outside is frightful, these delightful and sustainable woolly gifts will warm hands and hearts alike, even if you can't knit a stitch. From sculptural, pompom-bedecked helmets to glittery, foot-warming slippers, we've got your gift list covered from head to toe�and not one Snuggie in sight.